Mango Strawberry Protein Shake was posted on July 8th, 2011 and is filed under Breakfast, Drinks & Smoothies, Gluten Free, Recipes. This entry has 15 comments. You can follow any responses through the RSS 2.0 Comment Feed. You all know I’m trying to take in more protein, less carbs, blah, blah, blah…and I’m proud to announce I’m doing much better at it. My nutritionist would be proud. She has told me that with my tall-ness and activity level I need at least 90 grams of protein a day. Let me tell you, it’s no easy feat trying to get that much tucked inside of me by the end of the day…specially when I’m not super crazy about certain meats. Or meat in general. What I crave? Not protein, not meat, not salt…its sugary things. Horrible, I know. I wish I didn’t. It would make life so much simpler. But I always get excited when I find a way to get nutrition, protein, and even my cravings for sugar all in one package. For me, this shake fits the bill. My Mom actually made this one up and I mooched some of it off of her and said, “I need this recipe for my site!” It’s kind of amazing. So yes, this recipe serves 2, although…quite honestly, I would probably drink the whole thing…just because I would. Blend all the ingredients up in your blender. Stick in a straw and guzzle down. No, sorry… sip it politely. *For protein powder, we used Jillian Michael’s whey protein powder. I recommend this stuff, she’s really careful to use all natural ingredients, unlike a lot of other protein powders. And it’s really affordable at $10! I didn’t add up the protein powder in the nutritional info, because you might have a different protein powder with a different calories and protein count. If you do use this variety, it’s 100 calories per scoop with 10 grams of protein. I love drinking this sort of thing after a good, hard morning’s workout when I’m hot and sweaty…it’s just so refreshing and great for recovery! And it’s a lot faster than grilling up a chicken breast or boiling an egg! Do you drink protein shakes? Or do you prefer to get your protein in whole foods (meat, tofu, beans, ect)? Looks great! Instead of vanilla protein powder I use pollen granules for mine (mango, strawberry, banana and honey). That is a lot of protein. I am pregnant and am only recommended to eat 80-100. 90 Grams seems like a lot! Good luck with that. I am vegan and have the hardest time getting in 80 grams each day. I always do it, but its a full time job!! I love shakes and smoothies like this. I’ve never added any protein into it though as I think I probably get enough protein as it is but that is just an assumption. Love the flavors in this shake! wat a gorgeous click..the drink sounds fantastic..
awesome recipe collection with gorgeous presentation..
Love the retro argyle tablecloth/counter/whathaveyou! 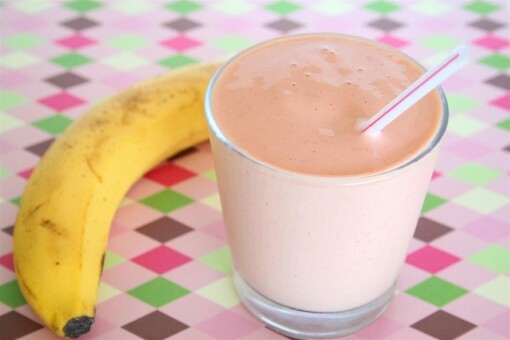 What can I use to replace the banana in this and alot of smoothie recipes? I hate bananas! Mimi~ You can just add extra ice – or replace the banana with 1/2 cup cottage cheese, yogurt, or add more mangos and strawberries!